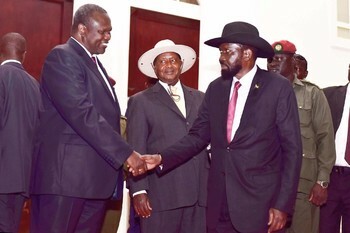 SOUTH SUDAN proposed power sharing deal – BUT WHERE IS MUSEVENI’S NAME IN THIS THING? RADIO TAMAZUJ – South Sudan government and the opposition were on Monday served with a peace proposal to share power in order to end the ongoing conflict in the country. -In the transitional period, President Salva Kiir shall continue as President of South Sudan with five vice presidents. SPLM-IO leader Riek Machar will assume the position of first vice president. -According to the proposal, apart from the first vice president there shall be no hierarchy among vice presidents. -The Council of Ministers shall comprise of 35 ministers, and the ministerial positions shall be 20 ministers for incumbent TGoNU, SPLM-IO 10 ministers, SSOA 3 ministers, FDs 2 ministers, and OPP 1 ministers. -According to the proposal, there shall be 10 deputy ministers during the transitional period. Incumbent TGoNU was given 5 deputy ministers, SPLM-IO 3 deputy ministers, SSOA 1 deputy minister and OPP 1 deputy minister. -The proposal says no fewer than three of the deputy ministers shall be women. No assistant presidents, other ministers or deputy ministers shall be appointed during the transitional period. -If more than two advisers to the president are appointed, the responsibility sharing ratio shall apply to their selection. -The transitional national legislative assembly shall be dissolved and composed of 550 members. Incumbent TGoNU was given 332 members, SPLM-IO 128 members, SSOA 50 members, OPP 35, and FDs 5 members. – The speaker of the national assembly shall be nominated by incumbent TGoNU. One deputy speaker shall be nominated by OPP and the other, who shall be a woman, shall be nominated by incumbent TGoNU. -The Council of States shall be dissolved and composed of 50 members or the closest figure that can be shared evenly by the states as per the number that shall be recommended by the IBC. However, the minimum number for the representatives of every and each state shall be two. -The membership of the Council of States shall be reconstituted as per the responsibility sharing ratio. -The speaker of the Council of States shall be nominated by SPLM-IO and the deputy speaker shall be nominated by incumbent TGoNU. -Within 30 days of the signing of the agreement, IGAD executive secretariat, shall appoint Independent Boundaries Commission (IBC) for South Sudan. – Members of the IBC shall be five South Sudanese who shall be appointed by the parties, one each, two representatives of IGAD states that shall come from states with no boundaries with South Sudan, three representatives of the Troika states and five representatives of the African Union that shall be from the c5 states. -The IBC shall be chaired by one of its non-South Sudanese members who shall be of recognized standing and integrity and who had occupied a senior judicial, executive or administrative position in his home country. -The IBC shall complete its work within 90 days. In all cases, it shall make its recommendation on the number and boundaries of the states during the pre-transitional period. -In the unlikely event of the IBC failing to make its recommendations before the end of the pre-transitional period, South Sudan shall have as regions the old three provinces, as per boundaries of January 1st 1956. This solution shall be adopted on temporary basis until the number and boundaries of the states are agreed. -The level shall be 55% for incumbent TGoNU, SPLM-IO 25%, SSOA 10% and OPP 10%. -State and local government shall be dissolved and reconstituted as per the responsibility sharing formula. -The positions that shall be subject to responsibility sharing include: governors, speakers of state legislatures, state councils of ministers, state legislatures, county commissioners, county councils, mayors and city councils. -In sharing states and local positions, parties shall take into account the relative prominence each party has in the respective state or Payam and effective administration of that unit.